A higher water volume does not always give better results, according to a spray technique test on 12 March for Gerbera cultivation in combination with Mainspring - a unique, reliable and friendly insecticide for land-based ornamental plants. The result: spraying with less water watering often gives similar or better results. The amount of water that can be used in combination with insecticides is being regulated more and more. A demonstration trial was set up by Syngenta Netherlands to be able to demonstrate the possibilities with the current spraying technique. All Gerbera growers in the Netherlands were invited on 12 March for an information meeting about spraying techniques and to view the trial. De meeting was arranged in collaboration with Erik Mooij (Guidance Crop Protection Greenhouse Horticulture) and Royal Flowers in Moerkappele, the Netherlands. The main purpose of the test was to see whether the water volume can be reduced when using Mainspring. To make the results more visible, Helios was used - a fluorescent formula that makes the spray visible under UV light. The test showed that there is a higher risk that the product will drip off of the leaf as soon as higher water volumes are used. On the objects A and B (2060 and 1780ltr/ha) was clearly visible that the spray liquid started to float to the edges of the leaf and even partially left the leaf – a so called run-off. At the objects C and D (1326 and 665ltr) the drops did not fall off the plant, but a good covering of the plant was still visible. An additional advantage is that if the water volume / ha is reduced by maintaining a higher driving speed, a considerable amount of time can be saved. 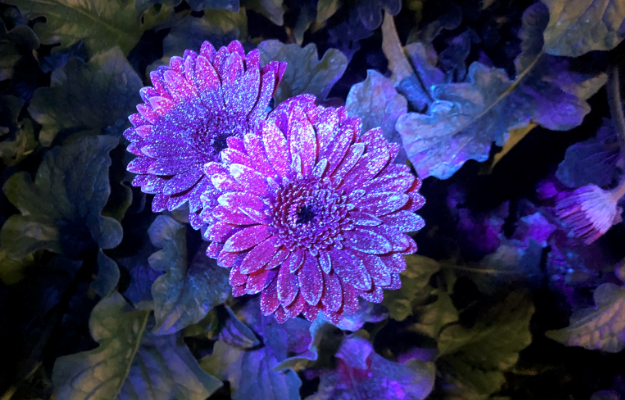 Although it is often preferred to use more water, growers themselves saw under the UV light that more water is not always better: the product is lost unnecessary because it drips off the plant. The trial results also show that in many cases a reduction of the spraying volume gives in many cases similar or even better coverage results, which positively influences the effect of the product.